This product information page is designed to help you decide whether the Lindy wireless IR extender set is right for you. It includes links to the top online retailers’ websites to save you time finding the best deal. 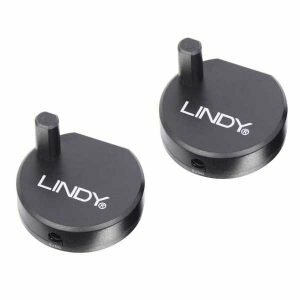 Where to find the best price for the Lindy wireless IR extender set. The Lindy wireless IR extender lets you control multiple audio-visual devices, using their existing infra-red (IR) remote controls or a universal remote control, in situations where you cannot point a remote control at the devices themselves. Lets you control multiple audio-visual devices. Wireless operation works through walls and ceilings so no need to run cables between rooms. Place the IR receiver in the room in which you wish to use the remote control and the IR transmitter in line of sight of the equipment that you wish to operate. Simply operate your remote control whilst pointed at the IR receiver and the IR transmitter will relay the control signal to your equipment.